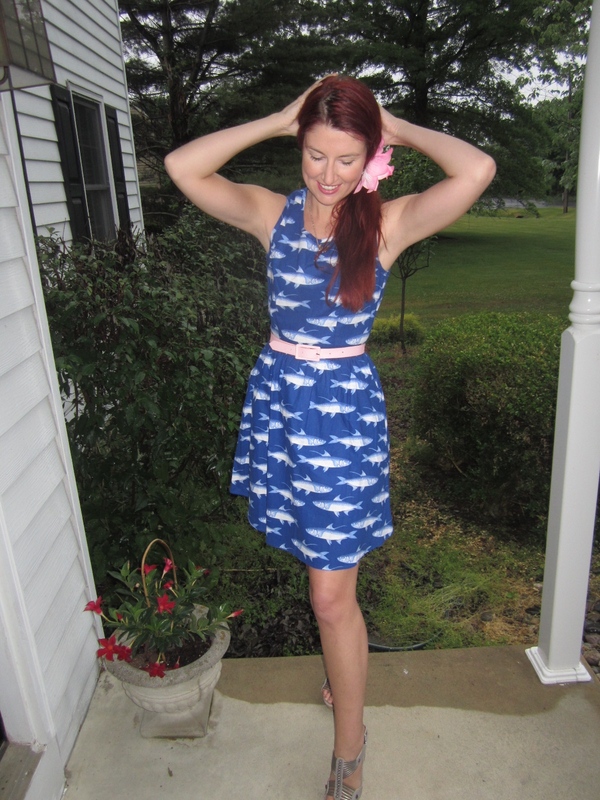 One of my favorite summer dresses! Folter/Retrolicious seriously makes some of the cutest skater/skater adjacent dresses with some of the BEST prints I've ever seen on clothing. This blue dress is like nothing I own in my closet in not only that it's such a rich combination of blue and grey, but who has such detailed fish on their clothes?? 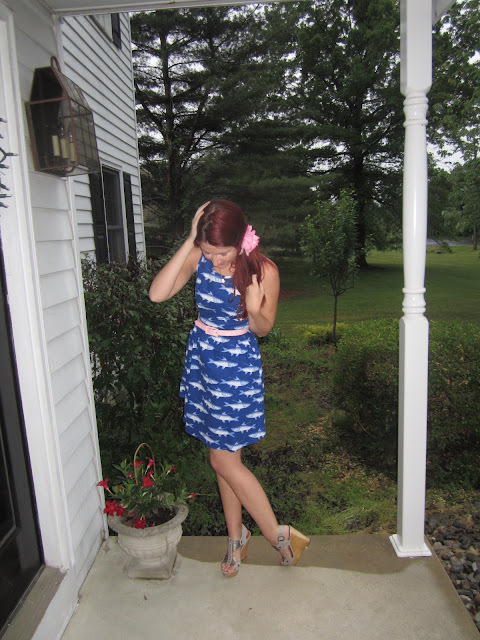 I took this outfit photoset while at my childhood home in PA and while packing I had B+ to A- organizational skills while packing (it was a super last minute trip; usually I'm much more organized.) Because of this, I didn't have every last thing that I could possibly want to accessorize this outfit. 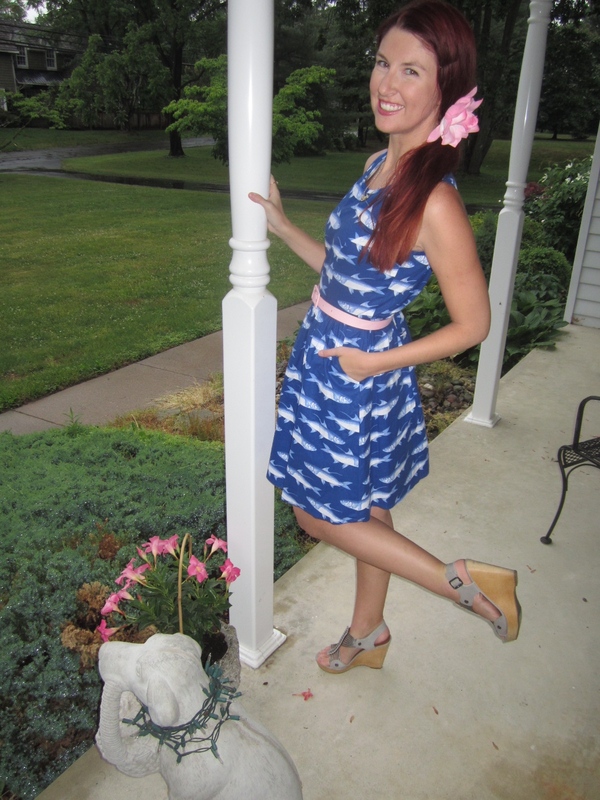 I had this pink belt from Hell Bunny, and though I had pink shoes they were more of the hot pink variety. 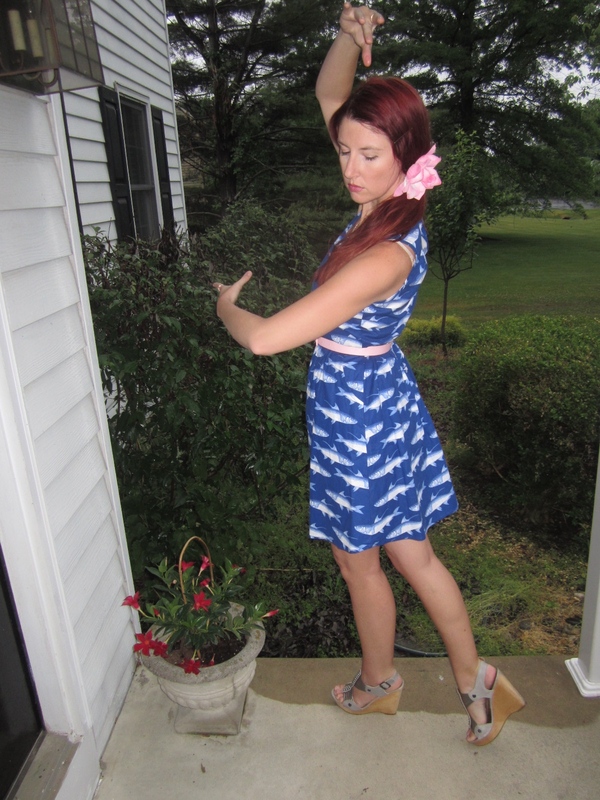 I decided to do a duel matching with the pink belt with my pink hair flower and my Steve Madden grey wedges with the grey in the dress. The blue I decided to let stand alone. Did anyone catch that this blog post is actually the name of a song? Being musically minded I decided that this must be the post title, haha! I don't wear side pony tails too often, but because my hair is officially mega long after growing it out from a bob for the past few years AND that I've been growing out my bangs, I've been getting more creative with my hair styles. Typically I wear hair flowers higher up, but this time I decided to cover my pony tail band instead. Love the print! Lovely outfit! Such a unique print on the dress! Totally makes it super fun. Love the pink flower paired with this. You wear the most unique stuff! I love it!!!! Very cool print Lauren! I love your set! Nice dress! Love your shoes! Thanks! They're some of my favorite shoes for summer! You look so cute at these pictures! 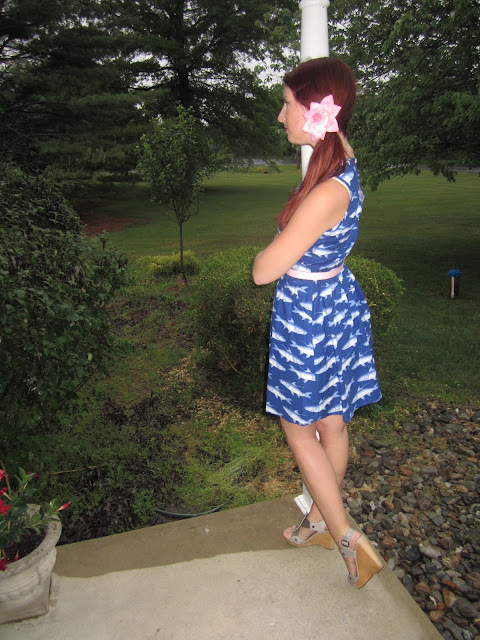 :) Love your dress, so perfect for summer! 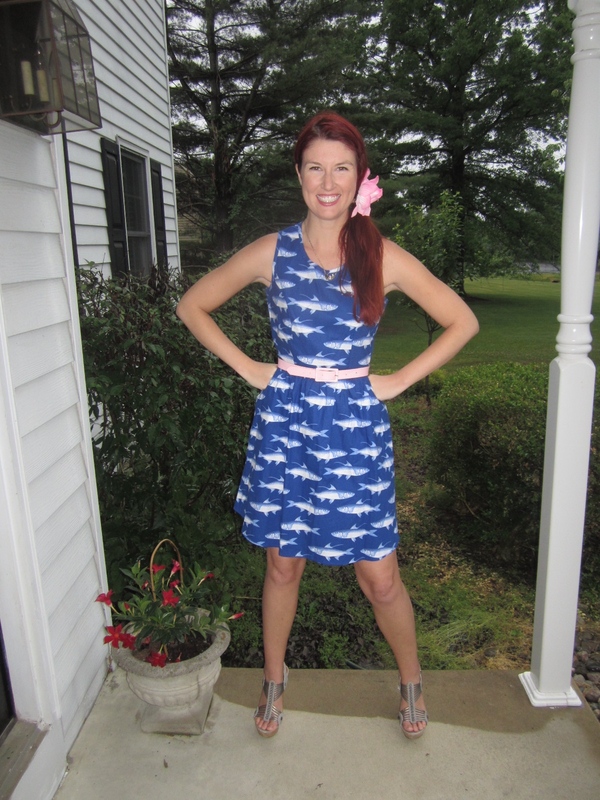 What a fun dress! 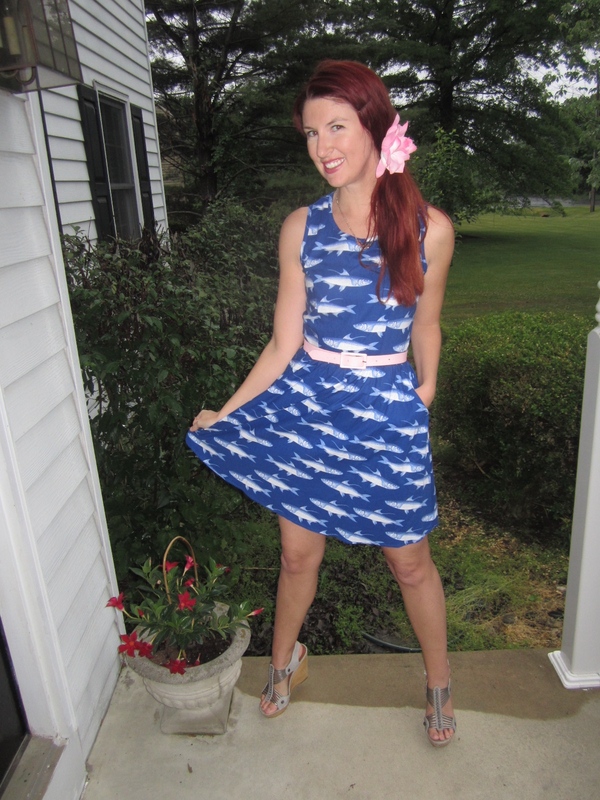 I love the shark print! I loved your dress and I am a fan of side ponytails, so I loved your pictures and style! I would have liked to see the pink shoes, too, but the way you styled the dress is very nice! You look very sweet and pretty! 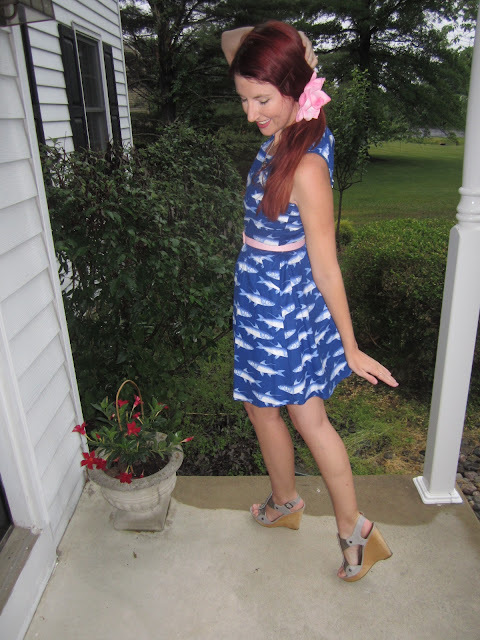 Who doesn't love a good twirly dress? I really love the cute fish print on it. My mom has one like it and I really love it! The side ponytail is so cute on you! Demure eh? I love the rhyme but hoping it is meant to be ironic! You are too much woman to be demure! Love the looks. Haha, yeah it's the poet in me and speaking to more the style of clothing I like. I'm likely changing it for the exact reasons you're saying haha. Thank you!! I will! Another cute Retrolicious print. :) I wear my hair in a side pony occassionally, too. Love the flower! Sweet summer dress! Love the side ponytail! I love that dress and your wedge too! This is super cute! Love that print! This is such a perfect dress! These dolphins are so cute! Your poses in these photos are so adorable. I wish I could pose like you. I feel so stiff when I do my photos haha. Really loving the side ponytail here with the flower in your hair. You look so pretty! I absolutely love floral anything. Cuteness all around here dear. I'm on Have Clothes, Will Travel today!